WOW, talk about a consistent pedigree. 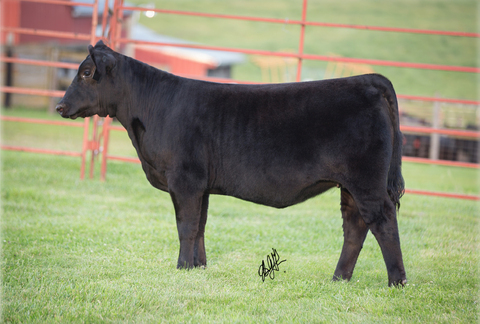 This is the 4th year in a row that a Monopoly X Alias calf has been lot 1 in The Showman's Choice Sale. 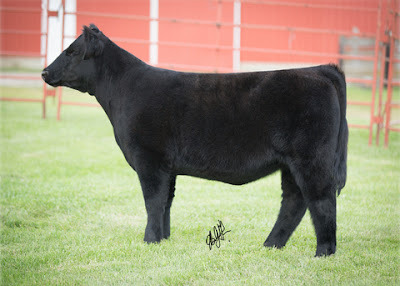 This ET steer out of our Dalia Donor is a full brother to the $42,000 steer in our 2013 sale that went on to be the Grand Champion Steer at Aksarben, shown by Vada Vickland. Of the ET calves, this one reminds us the most of the Vickland steer, he is so complete and sound! Here she is! 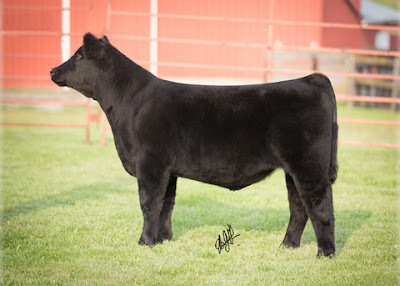 A full sister to our top selling heifer from 2013 that Ben Weis successfully showed as Champion Chi at the Iowa Beef Expo and Iowa State Fair and Res Champion Chi at Badger and Aksarben. We feel this heifer is a bigger bellied, more feminine and more extended then her sister was at this stage. 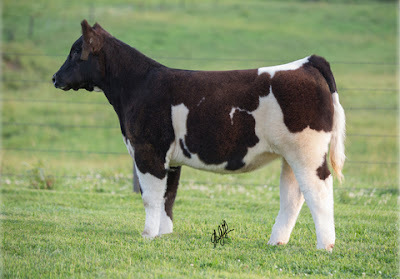 If you are looking for a big time Chi Heifer, look no further then Lot 2. I'm a pretty big fan of the I-80 females and we have a couple in this year's sale that prove why. This one will make a believer out of anyone! She is the daughter of one of Tessa's former show heifers purchased from Matt Lautner and raised by Oakley Kershner. A maternal sister to this heifer was the many time Champion Chi heifer shown by Violet Lapke. Lot 3 is so neat made yet thick and sound-hard to find a hole in this girl. 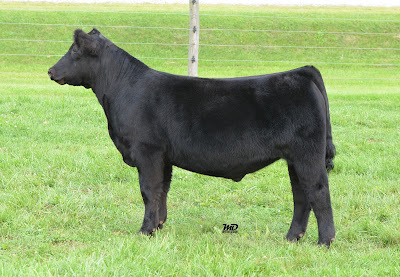 The mother of this heifer will become our next Donor! She has also been shown already and was the Grand Champion heifer at the Afton, Iowa Open Prospect Show. Lot 4 has been a stud since the day she was born. This MAB is from our Northern Lite Donor that never misses. 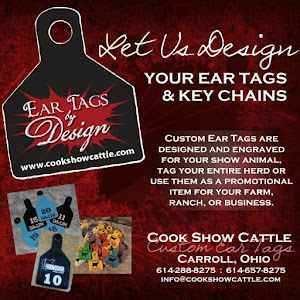 She has produced several high sellers and Champions over the years. This particular heifer is supper stout but still smooth in her design and sound as a cat. She reminds us of the her brother that was 5th overall at the Ohio State Fair in 2011 shown by Emma Prinz. If you want to play in Market Heifer Division jump in right here! This Brockle Faced MAB is the perfect example of a "Fat Steer". He is the natural calf out of Dalia, and maternal brother to Vickland's Grand Champion Steer at Aksarben. This one is a truck and has impressed everyone by how super stout he is yet staying so smooth and sound! This one will do some WINNING early and late! 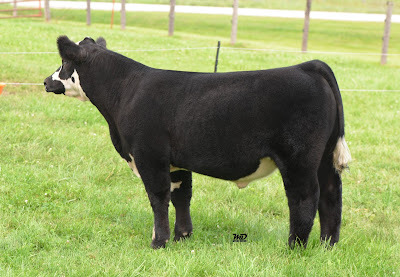 He has already started his show career and was Reserve Champion Prospect Steer, Iowa State Fair and Grand Champion Steer Afton, Iowa Open Prospect Show. Oh Buddy! 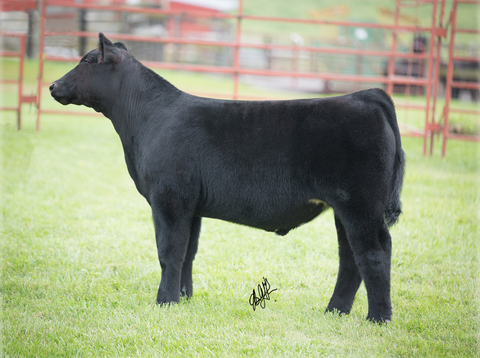 From the minute this guy hit the ground we knew he would be one of our top steers in the sale. 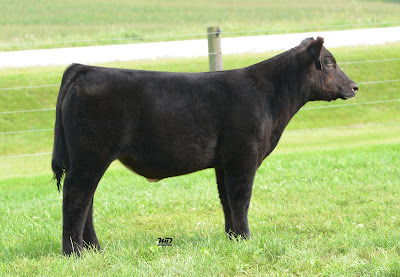 Lot 6 is Stout, chubby and one cool customer! He has been Carson's (age 9) buddy all summer long. 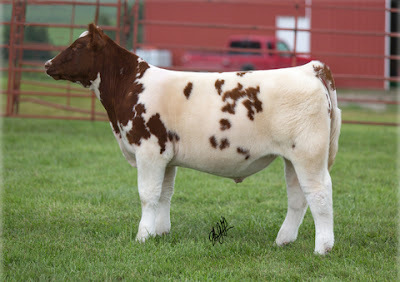 You will have to drive a lot of miles to find a simmy steer as good as this one right here. An ET full brother to Lot#1 and the Vickland Aksarben Steer. This one is so cool fronted, neat made, big boned and sound that he is sure to follow in the footsteps of his siblings. You better have space in your trophy room if you buy this one! Got Shag! 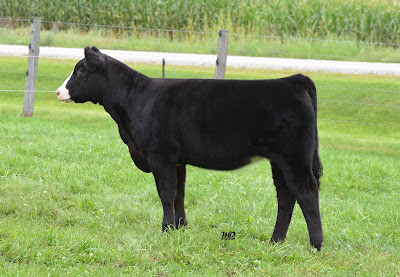 Another calf from our Northern Lite Donor that sure doesn't disappoint. She is super hairy, stout, sound and as big of a belly as I have ever seen on a BIM. Plus her attitude is A+ for any showman! 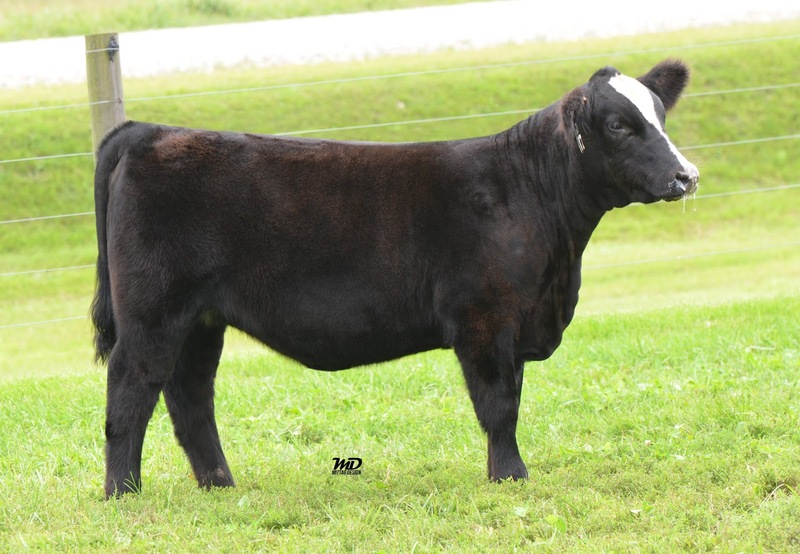 We feel she is best suited as a Market Heifer but that is for you to decide. 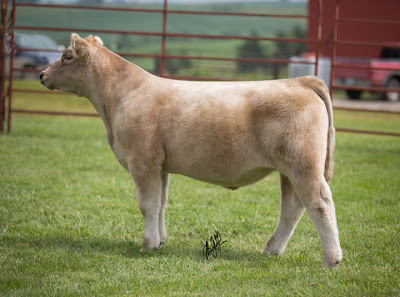 Charolais colored cattle seem to be the rage now and here is a really cool one! 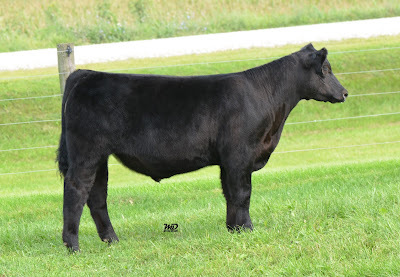 As soon as we put a picture of this heifer on the Blog and Facebook, we started getting texts and people were clicking "Like". Here is one super unique female. She blows people away with her Maternal Look, Freak Neck, Big Body and her Huge Feet. And yes...she too is out of an Alias cow! 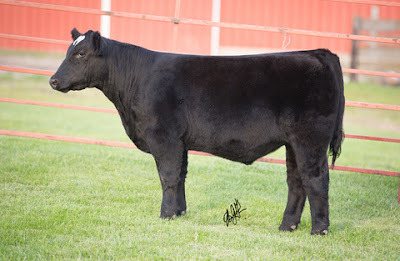 Her maternal brother was lot #1 and High Selling steer in last year's Showman's Choice Sale purchased by the Otis Family in Montana. Hole Hearted! Check out the markings on the head of this one. That is one the judge will not forget. This guy is a maternal brother to the Red and White steer we had at the State Fair Feeder Calf Show that was 5th Overall in 2013. This guy will hang his own banners too! This one could very well be a 'Major Player' in the Maine division, he was the Reserve Champion Prospect Maine Steer at the Iowa State Fair. STOUT-SOUND-STYLE pretty much the 3 things you like about this one. 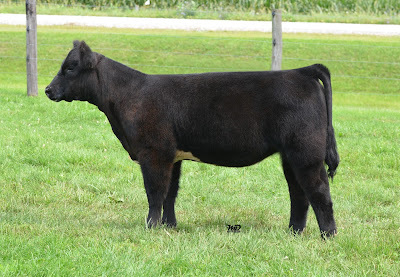 His mother is a first calf heifer we purchased through one of Matt Lautner's online sales. 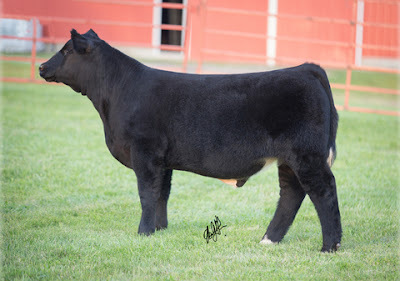 This steer reminds us a lot of the I-80 steer Tyson Tucker purchased in last year's sale and has shown very successfully this year. Flush mate to the Lot 4 Heifer. This guy came a little later but is sure filling out the last month. We feel in another month he is going to be just a good as his sister if not better. Just hope he is standing in your barn at that time! 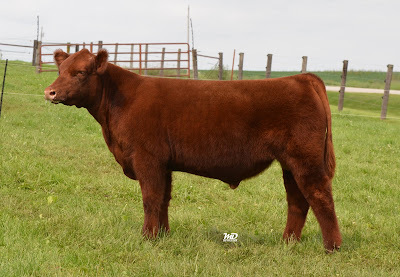 There is absolutely no other way to describe this red steer than to say he is really attractive! Those who have seen him have been totally amazed by how square hipped, cool fronted and elephant footed he is. 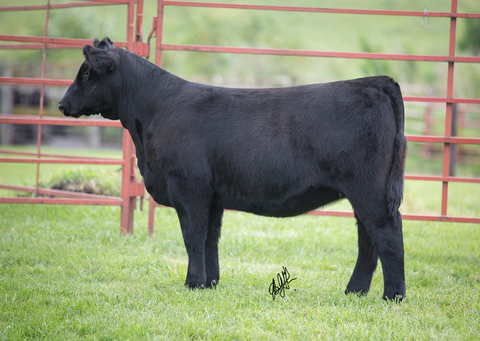 This steer is a maternal brother to last year's high selling heifer in The Showman's Choice Sale purchased by Eric Walker of Arkansas. 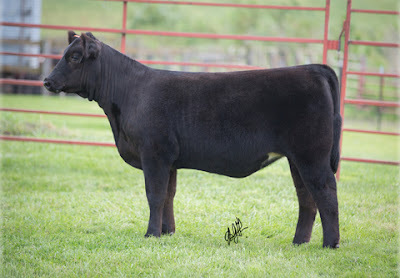 Lot 14 is one super stout, choke fronted, colorful beast! Her mother was a top seller out of our Northern Lite Donor back in 2012 that we liked so well we bought her back after her show career. As stout and as chromed up as this one is, everyone will know when you walk in the ring! Here is the Wild Colored ET Brother of Lots #1,#7 and #27! 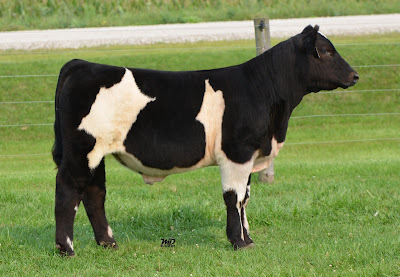 This one got the extra splash to catch the judges eye and once he has the judges attention, they will notice his Huge Bone, Big Back and Stout Quarter. This one will be fun to show! This guy is a flush mate to Lot 14. He is just as stout but has a bit more extension and is sound as a cat. You get this guy on full feed and watch him drop a big old belly in and you will be standing at the top of the class! If you are serious about showing a commercial heifer that will make a simply awesome cow in the end, you better bid here! Really hard to fault this one-and who doesn't love a Blaze Face! Analyze this one real good. She is big footed, clean fronted, sweet profile with depth all the way to her flank. If this one had more condition and the hair she had as a calf she would be at the top of the sale order. We have liked this girl since day 1! Buy her and take her home and watch the magic begin! You will be glad you did! 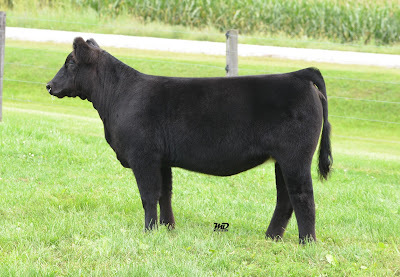 Here is a steer that couldn't be bred any better! He is really complete and one of our favorites. Take a look at how smooth made this one is, and I think he will be a great feeding steer. 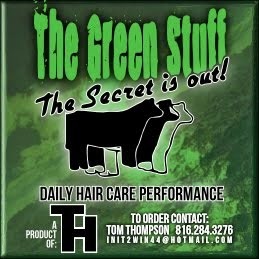 If you want to win a Market Steer Show-Buy this one! Every year we bring a Critical Mass to the sale and every year they do not disappoint. This Critical Mass x Northern Lite mating works every time! Her full brother was Grand Champion at the Louisiana State Fair in 2014. As good as this heifer is built I wouldn't be afraid to return her to the pasture after her show career...you might just have your next donor! This one will get better every time he heads to the feed bunk. He is very correct in his structure and very attractive. He is out of a first calf heifer and we have liked this one a lot all year. Who let the Herf out! This red dude is super chubby, sweet fronted and balances up real nice. 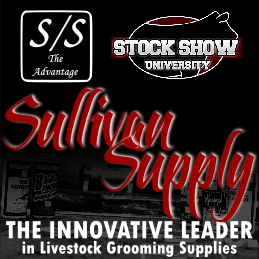 Let him put his hair back on he had as a calf and he is at the top of the class. This one is the youngest calf in the sale and will be hard to forget once you see her. She is absolutely Giraffe Necked and Market Heifer Stout! 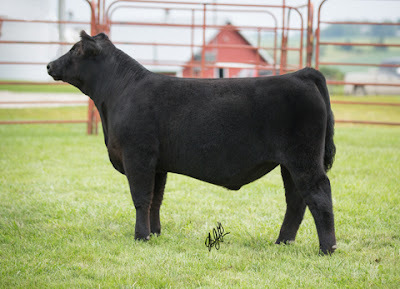 She is the maternal sister to many Champion Steers in Kansas for the Rusk Family and Iowa for the Means Family. Here is the natural calf out of the Carnac donor. This guy is square hipped, whistle fronted and big boned. All he needs is time and a feed bucket and he will make some noise in the ring! RED, WHITE & STOUT! 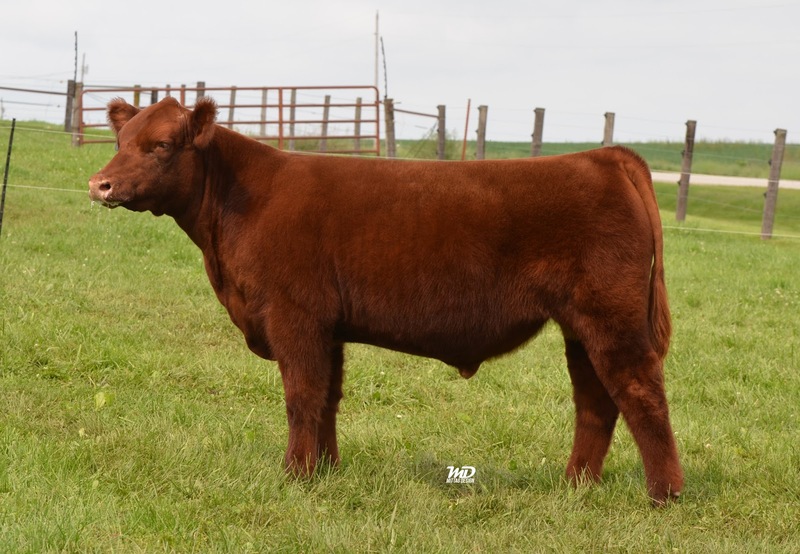 This market heifer prospect is certainly made the way we all want a market heifer made. She has been a stand out since she was born. You can feel confident bidding on this one! Anyone else notice the number of Smoke Steers winning State Fairs here recently? 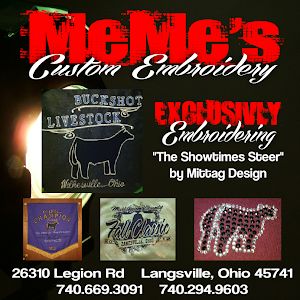 Did you also notice what those Smoke Steers looked like as a calf? We are real excited about this guy. He is square hipped, good fronted, big footed and good haired. All he needs is to drop his big ol belly in and he will be right where you want him! 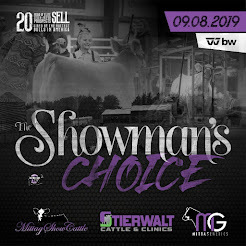 The final Mittag consignment to The Showman's Choice Sale is a rare opportunity to own a full sister to the lots 1,7 and 15 steers. She is a beautiful blaze face heifer that will make a great show heifer and cow. This heifer is super sound and has that extra look like the rest of her siblings. 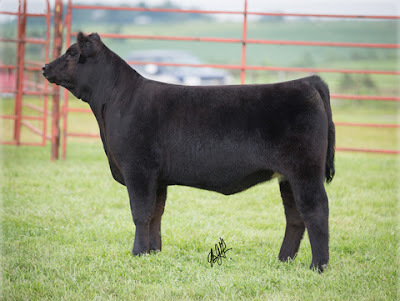 A full sister to this heifer is the mother to the I-80 steer successfully shown by Tyson Tucker this year and heading to Aksarben. He is the flush mate to the Lot 2 Heifer. This guy is a lot like his sister. Big Bellied, smooth made and as sound as you can make one. 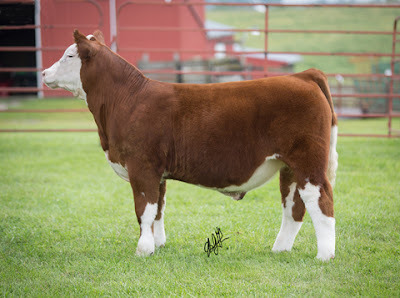 If you are looking for an easy feeding, soft made soggy Monopoly here he is! 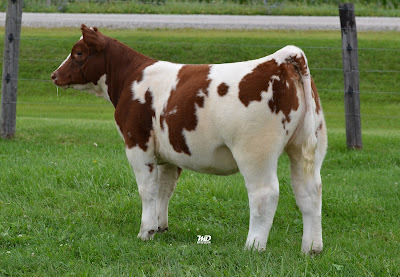 For all you out there looking for a Shorthorn Plus Steer, here he is! Very complete, smooth made, big square hip and whistle fronted! This steer will take you to the Final Drive! Lot 30 is a real feminine, long bodied, smooth made, sappy bellied MAB heifer. Good enough to compete in the ring, but her true calling will be when she is raising Champions for you in the pasture!